After testing out my practical skills on the intensive textile course at the TRC, Leiden, I bought flax seeds to try some experimental archaeology. 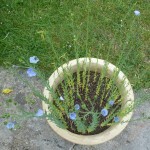 I grew flax successfully last year, with the basic aim of getting a better understanding of the plant and its fibres. This year I set myself a bigger challenge, to follow eighteenth-century instructions to uncover more of the challenges of flax growing, as well as raising new research questions. There are a multitude of guides to flax production, but I settled on a combination of two guides, Directions for Raising Flax (1772) which was published by the Commissioners and Trustees for Fisheries, Manufactures, and Improvements in Scotland to improve the production of flax fibre in Scotland and was given out free at all linen stamp offices and an undated manuscript from Berkshire Record Office ‘Derections to sow fflaxe’ (D/Ewe EP). The ‘Derections’ suggest a minimum of 2 bushels of flax seed per acre, ‘the Better the ground the thicker to be sowed’. The Directions suggest 3 bushels per acre for seed from Holland or Riga and 2.5 bushels of Philadelphian seed (p.3). Arthur Young in A Tour in Ireland, wrote that people in Armargh used 2.5 to 3 bushels of seed per acre (second edition, vol 1, p. 133). I therefore decided to try a ratio of 2 bushels per acre. Both guides agree that flax should be planted by the end of April. The ‘Derections’ state that flax should be planted after the last frost in April and the Scottish Directions, that it should be planted between mid-March and April (p.3). 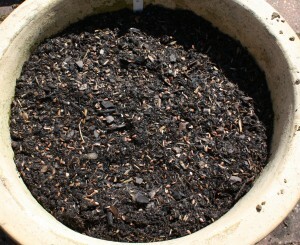 The unusually cold spring meant that I left off planting until the end of April. After some time spent calculating the weight of seed needed for 1 square foot of soil, I prepared the soil, making sure that it was flat and that big clods were broken up and stones removed (p.2) and planted the seeds. Within two days, all the seeds had been eaten. – This was my first lesson, while my crop was small, it showed me one of the problems that farmers faced and continue to face. I then planted my second crop in early May. I used two sets of seeds, one that I had bought in Leiden and were at least two years old and different seeds which I bought from a seed company this year. They were the same species, Linum Usistatissimum, but different varieties. Both the Scottish Directions (pp. 2-3) and the ‘Derections’ offer advice on the choice of seed. Both considered bright, heavier seed as more productive, with the ‘Derections’ specifying plumpness, roundness and a uniform colour; and the Directions giving instructions for bruising and tasting the seed as further criteria for seed quality. Working out which was heaviest proved impossible. 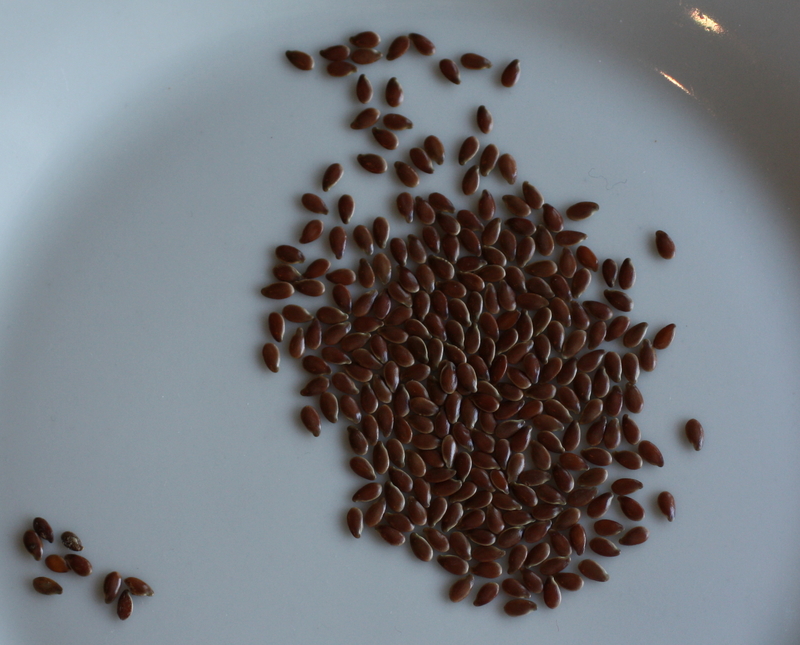 Brightness and uniformity of colour were easier to judge, based on how healthy the seed looked. Plumpness and roundness were more difficult, given differences between the two varieties – most of the new seeds were pitted in places. 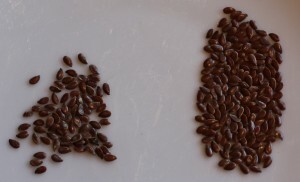 The photos above show what proportion of the same weight of seed fulfilled the criteria: in each image the pile on the left is seed, that the instructions considered was not fit for purpose. This however excludes uniform colour – the majority of the tips on the old seed were pale – it would have categorically failed this test. The next instruction in the Directions was ‘that which appears, when bruised, of a light or yellowish green, and fresh in the heart, oily, and smells and tastes sweet, may be depended on’ (p.2). The new seed met these criteria much better. 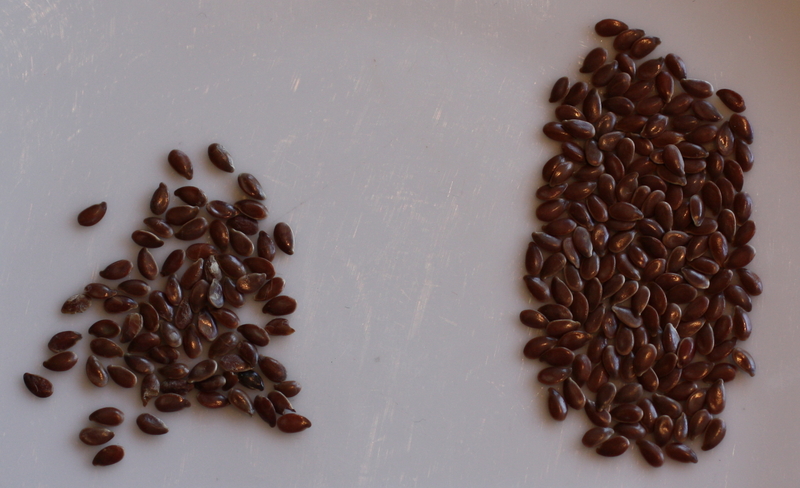 When I bruised them (with a spoon) some specks of oil came of of the old seed, but lots oozed out of the new seed (right hand image) oil came out of both seeds, but more came out of the new seed. (Flax seeds are used to produce linseed oil and are edible). 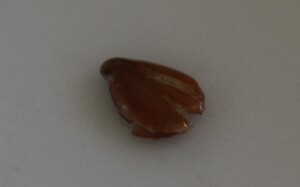 The core of the new seed looked fresher although it was white, rather than the yellow of the old seed. I couldn’t smell either seed, but the new seed had a pleasant almost fruity taste whereas the old seed had little flavour apart from a sweet aftertaste. To prevent this batch of seed from being eaten again I planted it in two pots – separating the old and new seed, and ahistorically taped clingfilm over the top until they had germinated. The pots were 30cm in diameter, which meant that the area was smaller (at 706.5 cm squared) than the one square foot (900 cm squared). I oversowed because I was unable to measure any smaller volume than 2ml, and reasoned that up to 4 bushels could be sown per acre, so I was still following contemporary instructions. The ‘Derections’ state that ‘to know if you have sowed thick enough wet the underside of your thumb and see if it take up of the seed sown 14 or 15 seeds at once’. I only picked up 5 or 6 seeds on my thumb, so next year I will try a really dense sowing to see how it affects the growth of the flax. Germination took a long time because the atmosphere was too hot under the clingfilm. When the weather cooled the flax started to germinate. Clearly I’m going to need to change this next year. The seed that did grow, grew well however and had gone to seed by mid-July. 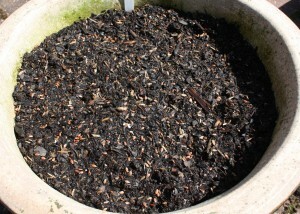 The majority of seed did not germinate at all, not helped by a squirrel digging a hole in one of the pots! I am not sure which factor was most responsible for low germination – the heat under the clingfilm, animals, the ‘dud’ seed, or something else and as a result I am going to repeat the experiment next year to try and work out the answer. However, I did successfully grow two crops of flax. The difference of the varieties was apparent in the flowers – the new seeds bought from a seed company had larger, more attractive flowers. Two very basic points which I saw for myself; birds and mice could decimate crops and the impact of unusually hot or cold weather. Distinguishing between good and bad seed is relatively common sense – because the seed is supposed to be shiny any problems are quite obvious. The most helpful test was bruising the seed. 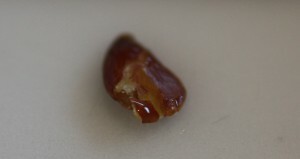 The quantity of oil that comes out reveals how old the seed is. There was a noticeable difference in taste too. It would also be easy to learn which seed to choose if taught by someone else. So, did you try again in 2014? No I didn’t attempt flax growing again in the end. But I did have a go at breaking, scutching and hackling in America – I wrote a post about it. Interesting, good luck in your experiment, let me know how it goes!